Turn Your TV into a Smart TV with the Google Chromecast Streaming Media Player! Disclaimer: This post was sponsored by Best Buy. I am receiving a Best Buy gift card in return for my thoughts on this amazing new device — and I truly do think it is amazing! Looking to find an easy and inexpensive way to eliminate Cable? Want to be able to watch things from a mobile device on your HDTV? Now you can!! 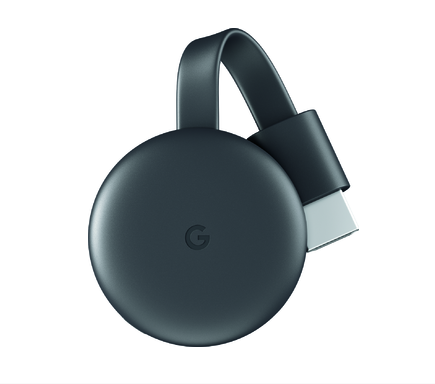 ANY TV with an HDMI port can seamlessly stream anything from your phone or tablet with the new Google Chromecast Streaming Media Player. Watch movies, shows, live TV, YouTube, and photos streaming on your TV from all your family’s devices. All you have to do is plug Chromecast into the HDMI port on your TV and you can power and stream your favorite entertainment right from your phone with just a tap. Watch shows, listen to playlists, and more. And while streaming, you can still use your phone as you normally do. Over 2000 apps like Netflix, YouTube, YouTube TV, and HBO NOW — obviously some have fees, so you pick and choose what fits for your family and budget. I love this as you are not trapped with any company or programming. Oh and if you have Google Home… you can control it all with your voice!! “Ok Google, play Stranger Things from Netflix on my living room TV.”! Love it. This is two pronged really… a) you can upgrade your TV if you don’t already have a Smart TV… all just by plugging in the Chromcast. and b) You can get rid of your cable and just pick and choose what you want to stream. The Chromecast just connects to the internet through your wireless home network and then you can get started! Head over to Best Buy and snag one!! !